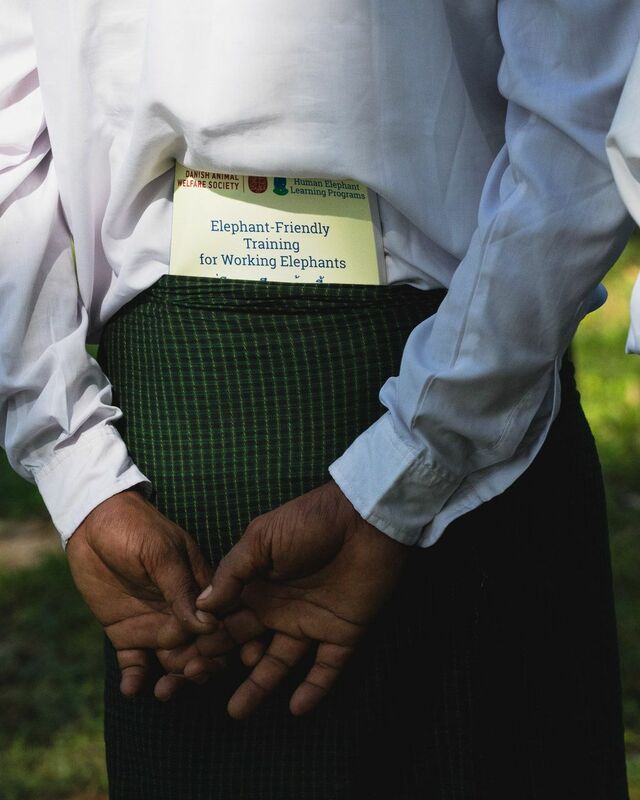 We’ve written a book on how to train elephants, just for Mahouts. In order to improve the welfare of working elephants, the H-ELP Foundation works where it sees the greatest opportunity to immediately improve the elephants wellbeing. We have developed new ways for mahouts to interact with their elephants, that when done correctly gives the elephant a more predictable and controllable environment. We run workshops across Asia teaching mahouts how to they can work with their elephants in more humane ways and to ensure they have a reference after the classes have ended, we have produced a training manual with images that can be referred to. The book has now been published in six languages (Malayalam, Burmese, Lao, Thai, Assameseand English) with a foreword written by Vivek Menon, CEO of the Wildlife Trust of India. South East Asia generally, The Elephant Task Force is clear in the recommendation that “In the long run, the Task Force favours the complete phasing out of elephants from commercial captivity. However, for the present, it aims to bring the upkeep to the highest standards through a synthesis of the finest traditions of elephant care including mahout practice and of modern scientific knowledge and practices accompanied by better regulation and monitoring”. However, this work of reference by Andrew McLean is not really about the question of captivity, but instead is a pragmatic manual to change one embarrassing aspect of the relationship that requires urgent attention; the cruelty meted out to the elephant by man during its training and sometimes due to the wrong foundations laid during training that has occurred intermittently throughout its long and sensitive life. Traditional ways have regrettably used the ‘punish’ rather than ‘reward’ method of training and also dwelt a lot on ‘breaking the will’ of the wild animal. This cannot be faulted when one thinks of how ancient this tradition is and how ancient man out of fear of this wild beast, the largest in his land, tamed it according to his best measure. He beat it, tied it and starved it. If it responded he untied it, rode it and then chained it. If it retaliated, he tied it again and beat it and starved it. Many centuries of this traditional shame continued hidden amidst the vast glories of the man-animal relationship. Andrew McLean comes from a more urbane animal training school, that of the horse. In training the equine, he realised that the Pavlovian reaction to reward was for animals, especially intelligent animals, a far more humane method to training than these traditional methods. Having said that, it must have taken him much toil and time to adjust that set of thoughts to fit the elephant and also to incorporate into science, that which was sound and humane in the traditional methods. Over the last few years Andrew McLean assisted by HELP has been visiting us at the WTI and we have jointly organised these alternate methods of training so that the elephants in captivity (and India has close to 4000 of these) are trained in a humane manner. His work has now extended to Thailand, Myanmar and Laos so many elephants and mahouts can benefit for a more humane approach. Those who feel that elephants should never be kept in captivity may well have a moral stand that is correct. But in reality the knowledge that there are still around 20,000 elephants in captivity and yet habitats are shrinking rapidly. Moreover, despite all the efforts of organisations such as the International Fund for Animal Welfare, elephants still come into captivity out of conflict or temporary displacements. This makes this manual invaluable. If elephants must come into captivity then welfare to these ‘near persons’ is an uncompromisable value. And of the several major and minor indignities that we heap on this most noble of our creatures, the early torture of training is one that modern society can do without. The beauty of this manual by Andrew McLean, HELP is that it is simple yet based on sound scientific principles of welfare based training: it is based itself on traditional practices and is yet futuristic in its ambit: and most importantly it has been tried and tested now in Nepal, India, Thailand, Myanmar and Laos. I see this as one of the major contributions to animal welfare in South East Asia and if mahouts across the land can adopt it, the region will be a kinder place for elephants. It is now estimated that half of the entire Asian Elephant species is now in captivity, and demand for our help far outstrips our capacity to supply it, so we function thanks to the generous donations of those that believe in our people and our work. All donations by individuals over $2 are tax-deductible and we are registered with the ACNC.